The Tulare County Agricultural Commissioner's office is announcing that six additional Asian citrus psyllids (ACP) have been detected on three traps south of the city of Porterville. The latest interceptions were confirmed by the California Department of Agriculture (CDFA), bringing the number of psyllids found in our county to nine. Maps and current information are available on the Agricultural Commissioner’s website by visiting: http://agcomm.co.tulare.ca.us/default/. The Asian Citrus Psyllid. It's 1/8 inch long. Kevin Severns, is a Sanger, California Citrus grower and general manager of Orange Cove-Sanger Citrus Association. He also serves on the Citrus Pest and Disease Prevention program. The yellow sticky traps that caught the psyllids were actually for glassy winged sharpshooters. The psyllids apparently flew in and got caught on the sticky trap. The actual psyllid traps are yellow/green and are also sticky traps. “One trap caught four psyllids, while two additional traps nearby caught one additional psyllids each,” said Severns. “We are little concerned that this find may not be denote a hitchhiker. It could be a more established population." CDFA has already begun to saturate the affected area with detection traps in order to determine the extent of any infestation. The United States Department of Agriculture’s Animal and Plant Health Inspection Service (USDA-APHIS) and CDFA will work collaboratively to determine what steps are taken next. “Thanks to the responsiveness and cooperation of our farmers and their neighbors, we were able to do away with ACP restrictions in mid-June, so it is very disappointing to have new detections pop up so quickly,” said Tulare County Agricultural Commissioner Marilyn Kinoshita. 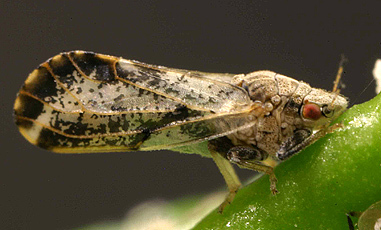 The Asian citrus psyllid is an invasive species of grave concern because it can carry the disease huanglongbing (HLB), also known as citrus greening. All citrus and closely related species are susceptible hosts for both the insect and the disease. There is no cure once a tree becomes infected. The diseased tree will decline in health, producing bitter, misshaped fruit until it dies. To date, HLB has been detected on just one residential property in the Hacienda Heights neighborhood of Los Angeles. Kinoshita points out that her staff will support the efforts of our $750 million citrus industry, as well as our residential citrus owners. “I want to emphasize that citrus fruit is safe to eat and the disease is not harmful to human health. The Asian citrus psyllid is another example of the many invasive species that enter our state every year”.